August | 2015 | Azazel's Bitz Box. And from Trolls, back to Dwarfs we go. 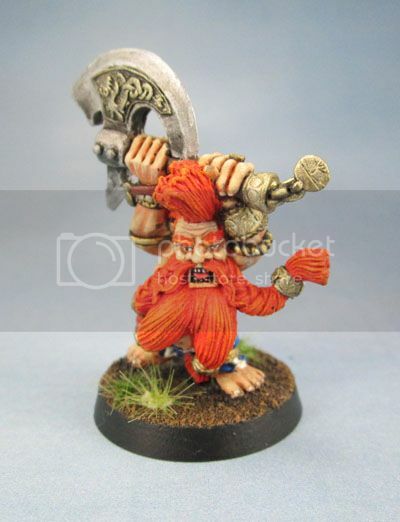 Specifically, the Original Troll Slayer model and an old Champion from Bugman’s Dwarf Rangers. 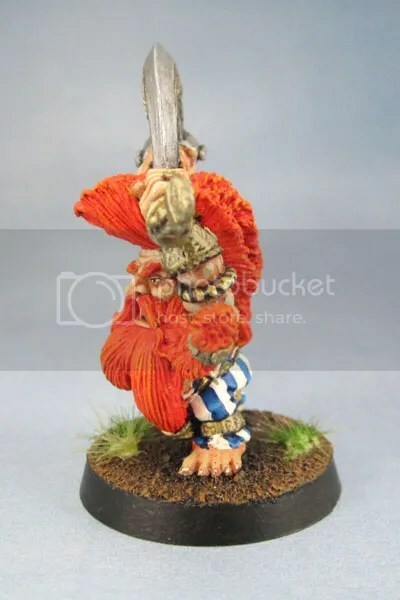 This Troll Slayer seems to have appeared in White Dwarf 97/Jan 1988 as part of the “Dwarf Adventurers” range (or at least that’s the earliest reference I can find, but it feels like a slightly earlier release). His name in that very old advert is “Wild Nyjhul” – perhaps a reference to Nigel Stillman? 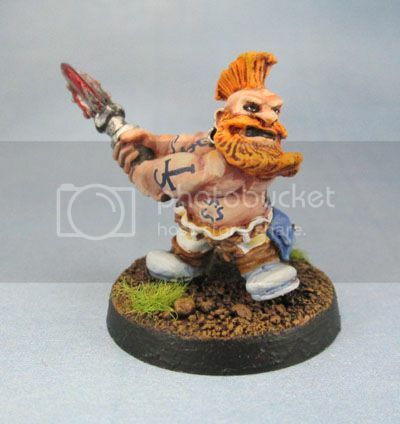 I painted this figure about 20 years ago and repainted it to “modern” standards a couple of years ago, at which point I added the tattoos. I gave him a more “natural” looking shade of orange for his hair and beard than the red-orange shade they usually have these days. Not the original RR1 version of Bugman’s Dwarf Rangers’ Regiments of Renown, but from what I can tell the second version “RRD1” released in Jan 1987 during the time of WHFB 2nd Edition. This piratical-looking guy is called “‘Owd’ Tom Thyksson”. Once again, this guy was painted long ago and given an update a couple of years ago. I gave him a paler skin tone, while the Slayer was given a more ruddy look. 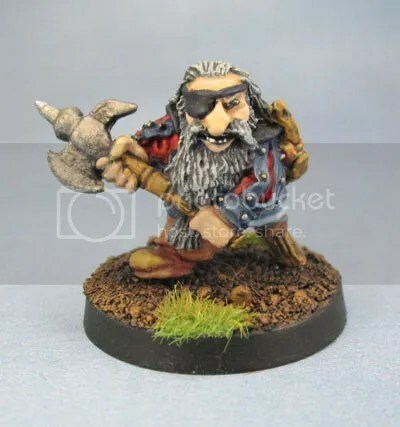 I’ll have some more Oldhammer dwarfs coming along again soon. But next… more Trolls! 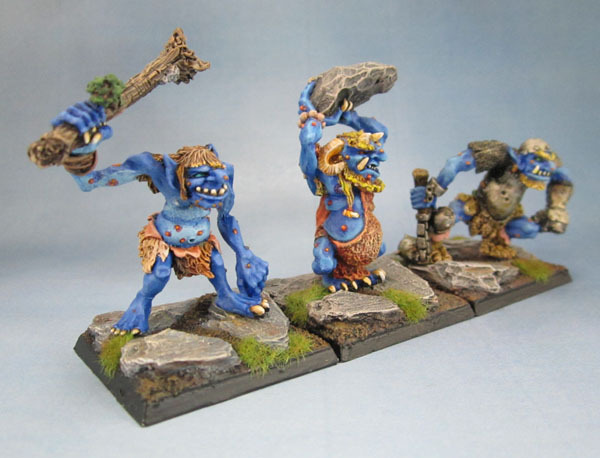 Citadel Miniatures’ C20 Trolls – All four! How do you best follow up a post featuring a Dwarven Slayer? I’ve shown two of these trolls before, just two weeks past a year ago now, as it happens. Last week, while stuck for something to paint I asked Marouda to choose some models for me to finish and as a result, I finally got a third finished for them. C20 Hill Troll – It’s Clubberin’ Time! Hill troll suffered a broken wrist many years ago, and with my meager skills of the day I “repaired” it by pinning and then wrapping wire around the join, as though it were bound with rope. Not the neatest of jobs, but it works passably, and I’ve not got the desire to destroy his wrist again in an attempt to repair it. 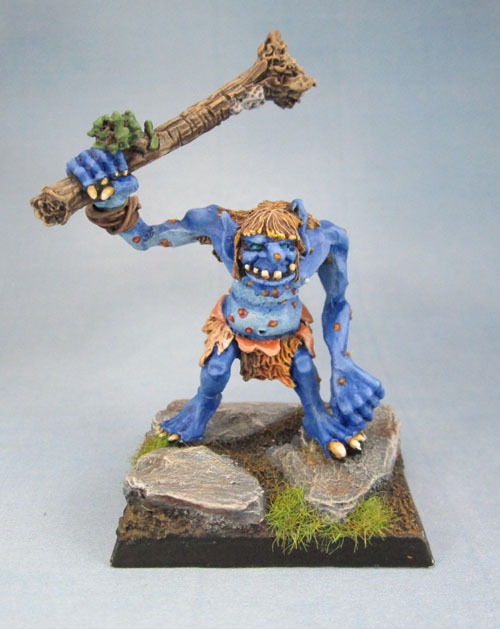 The two that have already been shown were painted Blue, as GW-style “Stone Trolls” probably sometime during the period of 4th Edition of WHFB. Most likely the one with the boulder overhead “Cave Troll” was painted as he was a pretty good approximation of a Stone Troll. “Warrior Troll” was no doubt painted to match, and the “new” guy, “Hill Troll” was definitely started with the other two in mind. He just took a lot longer before I got around to completing him! C20 Hill, Cave and Warrior Trolls as a unit. They’ll be used as a Regiment in KoW. These three together will make up a regiment-sized unit for my eventual Kings of War (Orc and) Goblin Army, made up of (mostly) older Citadel figures. Not to be confused with the Moria Goblins who I’ve been working on a fair bit this year. In the short-to-medium-term, there might be some crossover between the two, but only until I manage to get both playable. 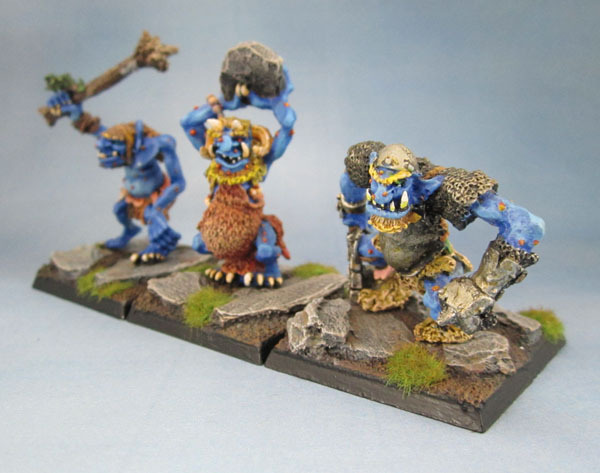 C20 Hill, Cave and Warrior Trolls – Painted as their later cousins, “Stone Trolls”. C20 Trolls in a Trio. C20 Trolls, circa 1987. Image taken from The Stuff of Legends. 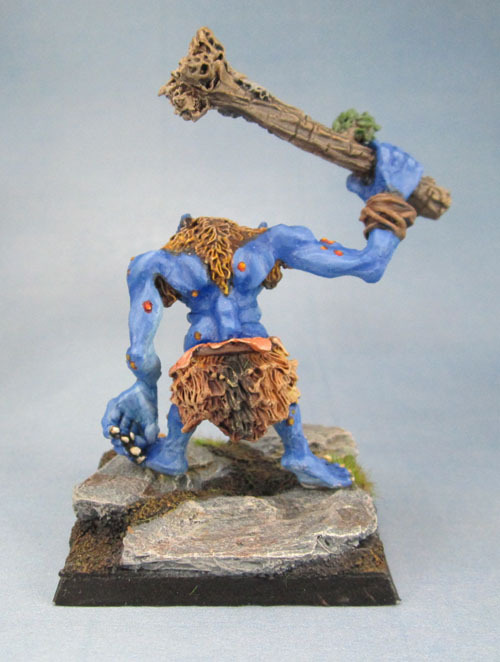 C20 Marsh Troll – doing his best Bigfoot pose. 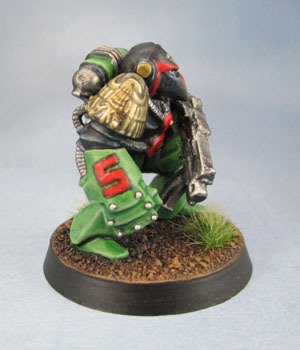 …and also as it happens, I’ve also got their fourth, here, who just needed a little touching up and a rebasing from his old, 90’s-style green-flocked base. 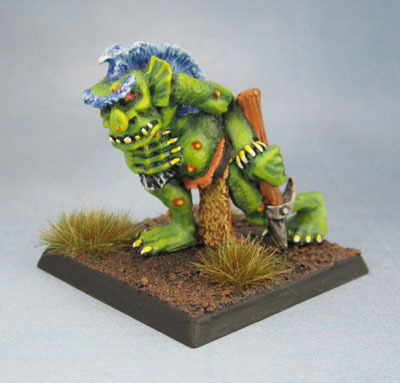 I’ll share Swamp Troll again sometime soonish with a bit of luck when I sort him out a pair of proper mates. 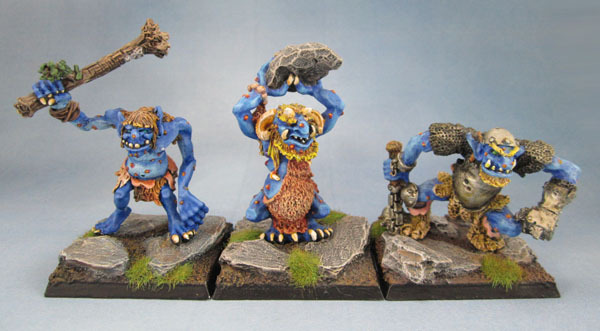 And the final shot – all four of the C20 Trolls Class of ’87. Finally completed! Not exactly Oldhammer this time, but still a few years old. I picked up this guy in a partially painted state off my mate Matt F, who I haven’t seen in an age now. So anyway, it’s probably taken me 15 years to get around to finishing him off. I’ve certainly been staring at him on my shelves since I moved into this house, and we’re moving up on three years of that now. I’d recently moved him up the queue and been actively wanting/trying to make myself complete him for a couple of months, and this past weekend I finally forced myself to do it. It turns out that this extended timeline very nicely coincided with my playing about with a different technique to my tried and tested method for doing gold/brass to, so maybe it all worked out for the best. Quite a lovely figure, I have to say. Sculpted by Colin Dixon and originally released as the Warhammer Quest Troll Slayer, it was re-released as a companion piece to the mid-1990’s metal slayers that were done by Aly Morrison. 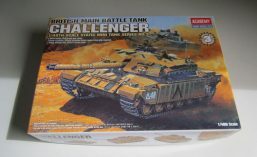 While some of those are nice enough models, this one is clearly the best of the entire range, so when it was moved to the WHFB range it was also renamed (or promoted) to Dragon Slayer, as befits such a fine model. I took these photos while the PVA was still wet on the grass tufts, hence the “white blob” look, which has now disappeared. Sorry ’bout that! I considered adding Slayer Tattoos, or Woad Warpaint, but it’s just such a wonderful model as-is that I decided that I prefer to keep him “clean”. I’ve now got plenty more Slayers to paint, after all – many who will come with much more appropriate amounts of skin to add ink to. Rear view, showing off his bright, stripey pants! He’s a bit bright, both with his pants and also his hair. But then, he’s a Warhammer model, so I’m fine with it. The shading on the white stripes on his old-timey Warhammer pants is a bit washed out by the lighting, but at least the blue showed up. 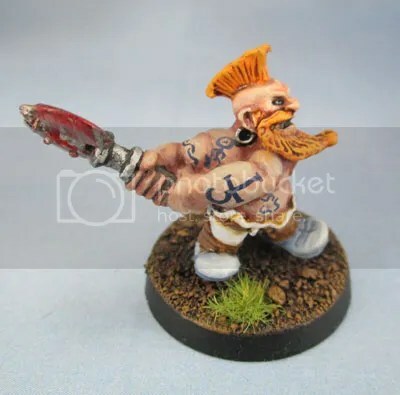 He could also look fantastic with a dark, grimy and stained look, but I’ve gone for the bright and clean style here which while far less realistic is just as valid an aesthetic for miniature painting. It’s like Goblin Green-skinned goblins! This photo is actually pretty unflattering towards the sculpt, but I decided to show it anyway. 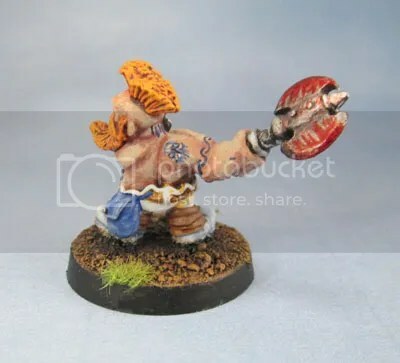 It really does show off the crazily disproportionate dimensions in GW-style dwarven sculpts as that rather hirsute head and clearly belongs on a far, far larger body. Still, as we so often say at my job – “It is what it is.” And this figure is a pretty great one from most angles. In gaming terms he’s perfect for a PC or NPC in WFRP and on the tabletop as a Slayer Hero. 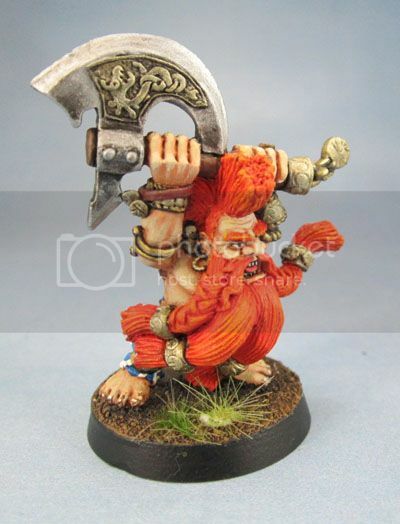 He’ll find some form of use in KoW eventually, very much as a Dwarven Berserker(slayer) hero. Until then, he can just sit in a display case and pretty the place up. 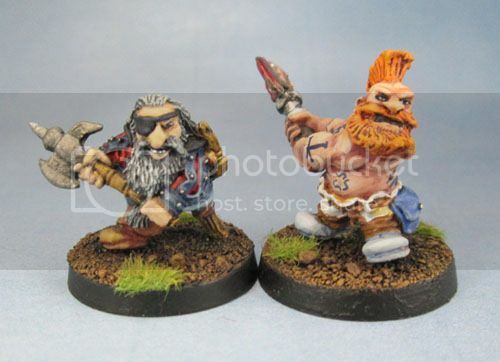 I’ve got some more very old Dwarves painted up here that I’ve completed over the past few years. I’ll have to get them photographed soon and up on display here as well. This figure was one I painted many years ago, and found in a box recently, beaten up and nasty. 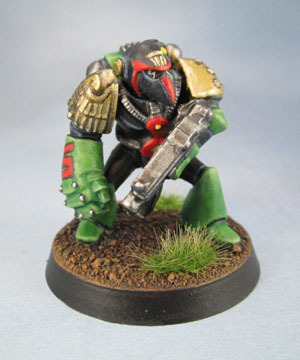 I’m sure that I’m far from the only person who as a teen decided that their metal Citadel Judge Dredd figures needed some more heavily-armoured backup and found that backup in the form of a plastic RTB01 Space Marine. After seeing the Mega-City One/Judgement Day project going on over on Sho3box, I pulled it out and thought to myself that I should repaint it. Last weekend, Marouda selected it as a figure for me to finish off to clear the paint desk, and so I set to the task. Kind of a complete repaint, and kind of an overpaint. The eye lenses are original, as is the numeral on the power fist. Everything else used the original paint as the base coat, and added modern highlighting and shading. The exception is the gold work, which was originally painted a bright yellow, and was simply plain. I decided to go for metallics, and freehand a MC-1 Eagle of Justice onto the pad. Because I can. I also stuck him onto a 32mm base, because apparently I’m also doing that now. Who’s the Law? I AM THE LAW! Money shot of the Eagle. Rear View of the RTB01 Judge. There’s a second one of these guys as well. Unfortunately he’s in the kind of shape that C-3PO was in about three quarters of the way through The Empire Strikes Back, so he’ll require a bit more work in order to recover. One day I’ll use him in Judge Dredd games, and also as an Imperial Adeptus Arbite in 40k/Rogue Trader/Deathwatch/etc. And in games like Frag! Back in the olden days, when I was just a pup, I played a bit of the Chaos Warbands variant of WHFB. My very first champion was a Skaven. Since at that time I had a Skaven army (which I later sold, keeping only a few figures) I did manage to pluck out an appropriate figure for use, with the sword, dagger, and a crest of evil-looking spines. 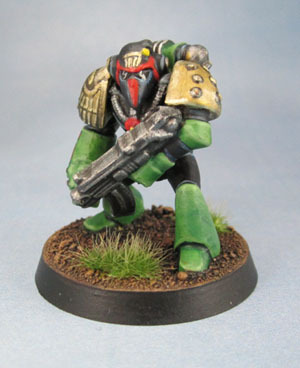 This guy had a very, very old paintjob, and so I’ve gone over most of it as well as rebasing him. The biggest changes were reversing the colours on his Skaven-style lorica segmentata, and a repaint over his clothing in order to brighten it a little, and getting rid of his yellow pouch. 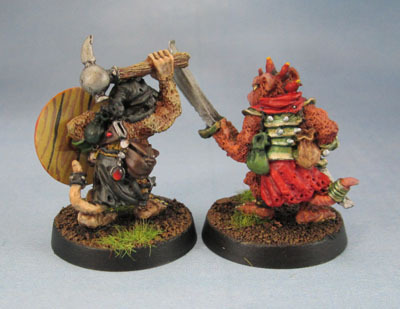 Skaven Champion of Khorne and Follower. I don’t remember the story behind his little mate, but I do remember having Khorne in mind when I painted up his shield, so I figure he can stand in for now as a follower of the first guy. he just needed as bit of a touch-up and tone down to bring him up to scratch. For the time being, I’m still a long way off building and painting my Skaven army, which will see the field under the Kings of War “Ratkin” list in the future. Until then, the odd Skaven that I may paint will be dropped into either my “Chaos” Army with my Realm of Chaos beastmen, or my “Beastmen” Army for any “cleaner” looking Skaven. Beastmen Champions of Slaanesh and Khorne. As part of my “Clearing the Painting Desk” push that I’ve been on for the past few months, I’m also including “Renovations” as valid. Turning old models that have been sitting unused in cases for years into models that I’m once again happy enough with to display or game with is something that really feels worthwhile. Sometimes it just takes a rebasing, other times it also requires touching up, and other times it requires a significant repaint of parts of the model. 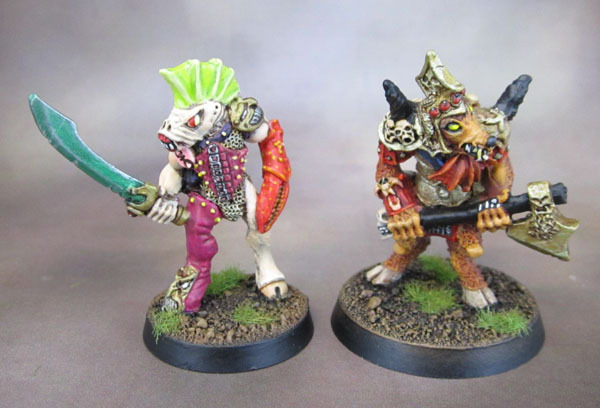 These two date from at least 1988, as they were both part of those waves of models released in conjunction with Realm of Chaos: Slaves to Darkness, the tome dealing with Khorne and Slaanesh. 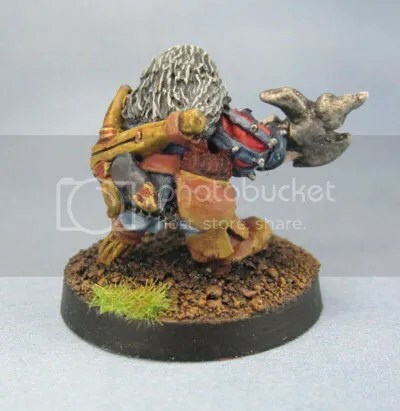 The Slanneshi model was originally released simply as one of the “Beastmen”, but they’re clearly a cut above most of their compatriots from those releases in terms of fancy-pants gear, and so I’ve always considered them to be Beastman Champions of their respective deities. The Khorne model dates back to (at least) 1985, a he can be seen in that year’s Citadel Journal amongst the C27 Beastmen, named “Khornag” at the time. I originally painted both of these two many years ago, and aside from the rebasing (Khornag receiving a new 32mm base due to his size), both also needed some repainting. Rear View of Khornag and the Slaangor Champion. The Khornate beastman – Khornag, a Kev Adams sculpt – had a few pieces of gear that were originally painted green (because contrast) were redone in cadmium red, the webbed ruff was reddened, the (badly sculpted) shoulder spikes were redone in black from their original “aged horn” look and the armour and metal parts were redone, with a bit more done to highlight and shade. Painting in the gems across his crown was the final bit of updating. 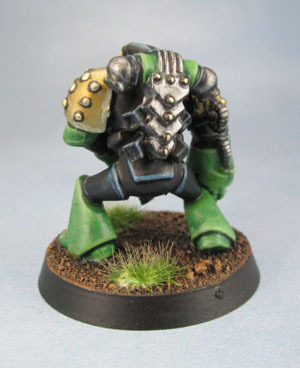 I never liked this Khornate sculpt, but the rebasing and removal of the garish greens have turned my opinion a little. It feels like a solidly ok figure now. Still nothing great, but decent. 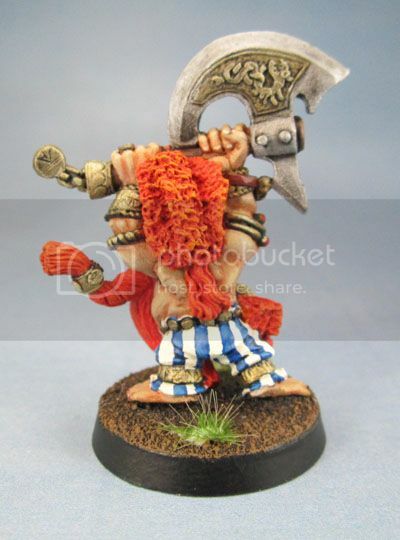 The Slaaneshi beastman – Slaangor Champion, which I believe is a Jes Goodwin model had much more of a repaint. 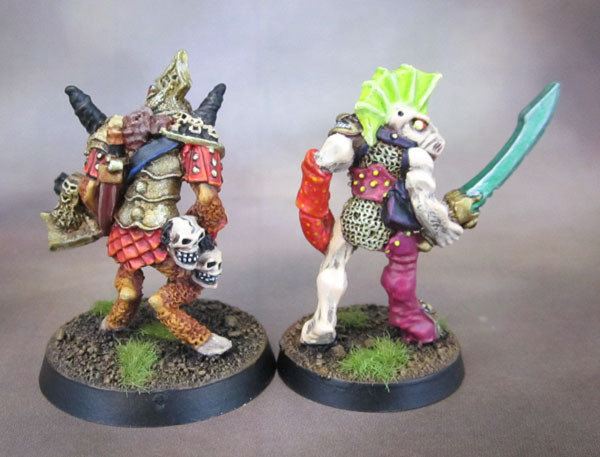 Back in the day I thought that “Slaanesh” meant “lots of garish colours” apparently. The leather legging (originally a pale, bright blue) was repainted to match the corset. The grinning face shoulder pad was originally pink, and repainted a dark gold/brass to match the sword’s furniture and foot guard on the legging – which also features a grinning face. The leather straps were changed from a deep blue to a Deep Purple(!) to better match the tone of the figure set by the corset and legging, and the bag – which was originally a horrid garish yellow was also turned into a Deep Purple. The studs on the leather strapping and legging were also changed to a pale, pastel yellow to match those originally on the corset. I deepened and highlighted the yellow-green of his fishy head-crest to define it a little more, and highlighted his pale skin further, though it’s a little washed out in the images here. The sword was originally a deep, dirty metallic blue, which I turned into a brighter metallic green. As with the Khornate, the brass was highlighted a little. The red crab-claw remains untouched, as does the pink panel on his right breast. I’d have repainted that one, but I decided to leave the freehand Slaaneshi rune untouched. A fair bit more work, but it’s turned this figure from what I’ve always thought of as a “trash model” into something I really quite like. 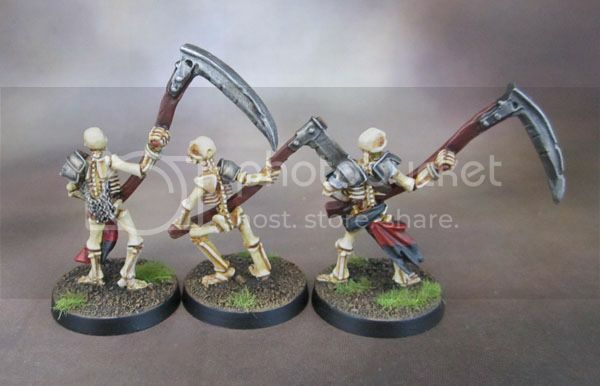 These guys will eventually be included in armies for Kings of War, but exactly which armies remains to be seen. 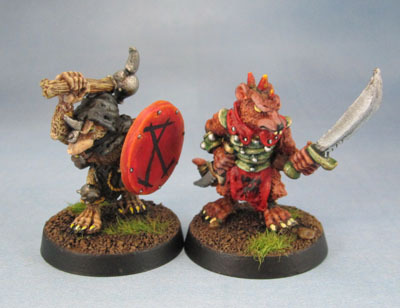 My Beastmen (Herd) army will be much more of a “Bestigor”-type army, while these two (and many of the others that are part of my renovations of my older models) are deeply Realm of Chaos-style Beastmen rather than the more feral Bestigor-style. 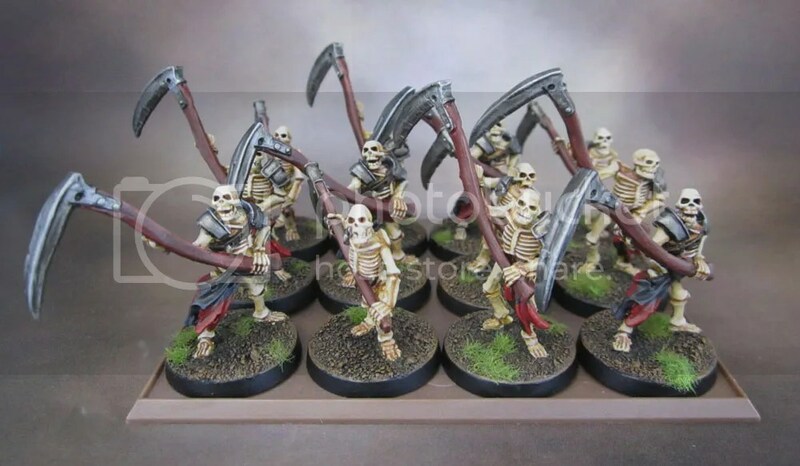 A couple of months ago I ordered a bunch of “Fir Bolg” Skeletons from Brigade Models, originally produced and still sold for the “Celtos” skirmish miniatures wargame. Roughly two weeks later, which translates to two months ago now, they arrived and I reviewed them. As I’ve said in the past, I’ve got a real soft spot for one-piece metal skeletons. There are some other lovely models out there, but many of them are very fragile – and I prefer more sturdy models for wargaming. Now, I’ve finished painting the first unit of them – or the first 12 out of the 59 models I purchased, at least. The colour scheme is pretty simple and in keeping with the rest of the army – Red and Black, Iron and Brass, Rust and Verdigris, Cadmium-Red wood – and Bone. The tabards and cloth have simply been quartered with the cloth colours to keep it simple. One each of the three sculpts for your perusal. I purchased four of each in order to set up 12 on a 100mm x 80mm base which will represent a Regiment in Kings of War. 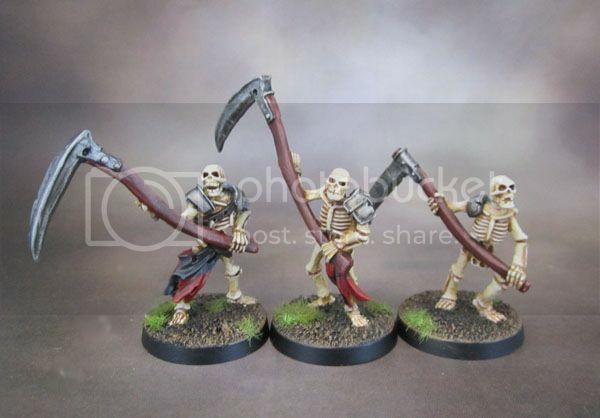 The Horde of War Scythe-Wielding Skeletons – Ready for some Reaping! The group shot showing all of the 12 I bought. Since we’re just talking about duplicate models, I thought it more interesting to skip showcasing each individual duplicated sculpt. 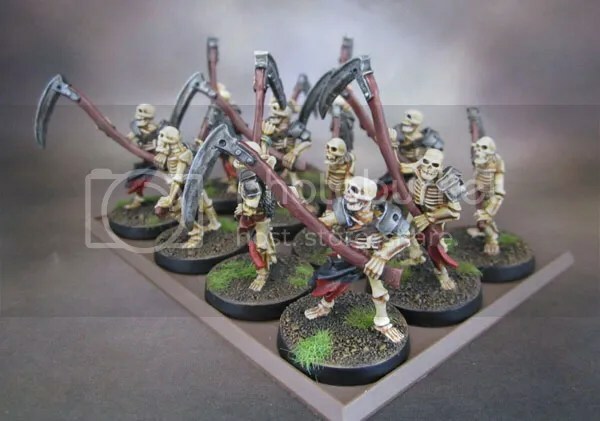 With a recent game of KoW against Marouda’s Undead showing how effective Horde-sized units are, I’m tempted to buy another set of these guys for her – and some of the other Regiment-sized groups as well! 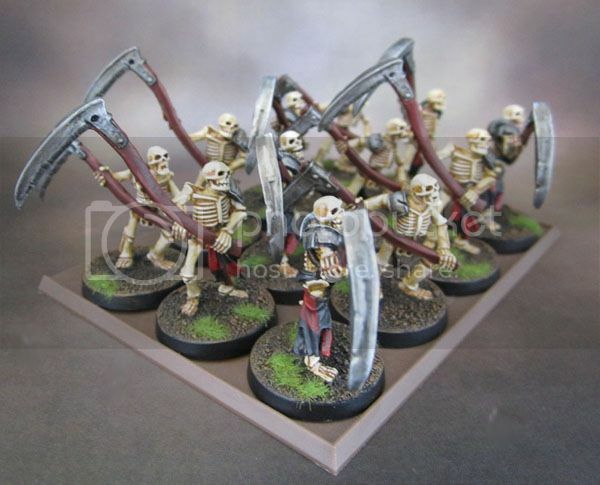 Brigade Games’ Skeletons based as a Regiment of Skeletons with 2-handed weapons for Kings of War. Based like this, the models work very nicely as a KoW regiment – Tournament-approved as well as I’ve checked with a key member of the Rules Committee. Beyond that they’re very easily popped off the regiment base for use in Role-playing or any other tabletop or board game. Maybe even Celtos! More poses would be ideal, but these will still work nicely enough on the table. Overall, I think these are great models – very much fit for purpose, and I’m very happy with them.